Dec. 10, 2013 – Christmas is approaching and brand New Year is on the way. On this holiday season, WonderFox Soft, a leading developer specialized in providing the best multimedia software for video/DVD and a wide range of popular portable devices, offers a mega Christmas Promotion that video lovers would be regret if they miss it. From Dec. 11, 2013 to Jan. 10, 2014, new and regular consumers are entitled to get up to 70% big discount on eight of our Best-reviewed products: DVD Video Converter, HD Video Converter, Video to Picture, Video Watermark, Photo Watermark as well as other powerful applications, making you experience surprising huge savings. Special packs of DVC + Video Watermark and DVC + Anti-malware (1year/1PC) are followed during this holiday season to fulfill different users’ demands. Take this valuable chance to get your early Christmas gift right now. 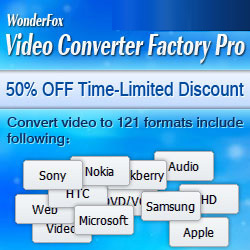 Select our acclaimed presents for your beloved family and friends at WonderFox Promotion Page: https://www.videoconverterfactory.com/promotion.html. As our blockbuster product, WonderFox DVD Video Converter is provided on the top according to feedback from a majority of consumers. With this powerful DVD/video tool, preserving and sharing the happy moment from your favorite DVD movies couldn't be easier than ever before. WonderFox DVD Video Converter is a very powerful integrated tool with DVD ripping, video converting and online video downloading functions. User can apply it to rip DVDs with the latest encryption technology and encode video clips/audio to several formats, including AVI, VOB, FLV, MOV, MKV and 3GP and back up videos recorded by camcorders and more. Its basic editing features allow user to crop, clip and add special effects to source files before conversion, which can let user do more with their videos. Its handy video downloading feature could also be a big help for web video enthusiasts to convert homemade Christmas videos and upload to YouTube, Vimeo, Facebook, etc. More than that, WonderFox Soft offers consumers various choices instead of single option of video converter. This year's Christmas gifts are packed full of incredible deals, including holiday price reduction in WonderFox Xmas DVD Video Converter Pack: DVC + Video Watermark Pack and DVC + Anti-malware (1year/1PC) Pack. As for HD Video Converter Factory Pro, which is equipped with advanced High-Definition (HD) video conversion technology, it can help users convert videos from Standard-Definition (SD) to High-Definition (HD), and it can also help users cut down the video size to convert HD videos to SD videos. Builds in 100+ video formats, it can convert nearly all popular videos besides the SD video and HD video. For example, it can convert Multi-track HD video M2TS, MKV, AVCHD, HDTV BDAV and MPEG-TS and so on to wide range of popular video and audio formats. The best thing is that WonderFox Soft also has a daily discount offer with different Windows programs giving out continuously. Share the post on its Facebook, you can possibly have a chance to get Life-time Upgraded license of its products. Visit its Facebook page to get more promotion information.